In August 2017, a series of wildfires smouldered on the tundra near the town of Kangerlussuaq in Greenland. The biggest of these fires burned 3,000 acres. It was small by most wildfire standards, but enormous and unheard-of on a frigid island that is mostly covered by ice. The following summer, the normally soggy Arctic and sub-Arctic forests of Sweden, Finland, and Norway burned as they had never done before. At one point, Swedish authorities appealed to the international firefighting community for help. Strange and uncommon as these wildfires in the Arctic appear to be, they are part of an alarming trend that has come into play since 2003 when an estimated 27 million acres of taiga burned in Siberia. Fires in Alaska and the Yukon territory the following year were also record breakers. Six percent of Alaska and four percent of the Yukon burned that year. The list since then has been growing. But the real head spinner was the the Anaktuvuk fire that burned big on the windswept tundra along the north slope of Alaska in 2007. It burned for nearly three months, releasing 2.3 tons of carbon into the atmosphere. The fire accounted for 40 per cent of the area that burned in the state. According to paleoecologist Phil Higuera, this region hadn’t burned in any significant way in 5,000 years. Like receding sea ice, which waxes and wanes each year along a trajectory that is heading toward a seasonally ice-free summer, Arctic wildfires are increasing in size and severity, albeit erratically. By the end of the first decade of the twenty-first century, large wildfires in the northern regions increased in size tenfold compared to those that burned in the 1950s and 1960s. This should be no surprise given the fact the Arctic is warming faster than any other place on Earth. The implications, however, are alarming. As climate continues to play a role in the way fires burn bigger, faster, hotter and more often in the north, it is becoming increasingly clear that the conifers of the boreal forest in the sub-Arctic, the sedge meadows, and lichens of the tundra are not responding well to the changes in hydrology, soil chemistry, permafrost thawing, and slumping that come when severe wildfires join forces with warmer, earlier springs and summers and extended droughts. The frozen landscapes that once favored millions of free-roaming caribou are morphing into shrubbier tundra and aspen-dominated forest that moose, bison, and invasive species such as deer favor. This is going to make it difficult for the Arctic’s indigenous people who see caribou and reindeer, and many other Arctic animals in much the way southerners see cattle and other form of livestock. Unable to afford the high cost of beef and other meat products that have to be flown in at great expense, they, as well as non-native people in the north, hunt these animals in large numbers to put food on the table. Food security is not the only issue for indigenous people. Fire is also beginning to threaten their homes. One out of three of the hundreds of evacuations that took place Canada in the past 30 years has involved indigenous people living in the northern boreal forest. These people comprise less than four per cent of the population of the country. Most scientists agree that it is going to get much worse as rising temperatures, drier conditions, and an increasing number of lightning strikes trigger more fires. According to the U.S. National Climate Assessment, the extent of area burning in Alaska is projected to double by 2050 and triple by 2100 if greenhouse gas emissions are not brought under control and runaway Arctic warming continues. In June of that summer, a slow-moving low-pressure system moved slowly through the state producing little rain but plenty of fireworks. By the time the storms finally petered out after five days, 61,000 bolts of lightning—15,000 in one remarkably electric day—had been unleashed on the boreal forest below. No one had ever seen anything quite like it, not even in the record-breaking season of 2004, when 8,500 lightning strikes were recorded in one day in the midst of the state’s most intense fire season ever. Lightning from those storms triggered 270 fires. Just over 5 million acres of forest burned. Seventy homes were lost. Mercifully, no one died. If the rains hadn’t come, according to Scott Rupp, a wildfire ecologist at the University of Alaska Fairbanks and university director of the Interior Department’s Alaska Climate Science Center, as much as 10 million acres might have burned. That would have made it the largest runaway wildfire season for a state, province, or territory in modern-day North American history. It would have rivaled the Black Dragon fire that burned along the Siberian/Manchurian border in 1988. That was the biggest fire documented in human history. Edward Struzik is a fellow at Queen’s Institute for Energy and Environmental Policy at Queen’s University Canada. 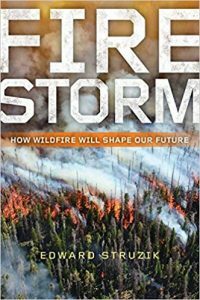 His latest book, Firestorm, How Wildfire Will Shape Our Future (2017), is published by Island Press, Washington D.C.